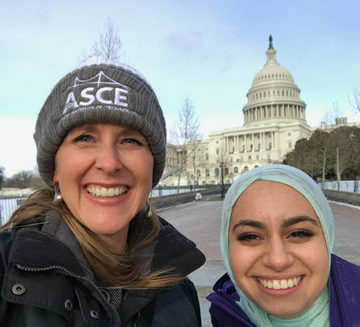 ASCE’s 2017 President-Elect Kristina Swallow, left, and her job-shadow companion Suzy Trabia, a Younger Member from Las Vegas. It’s likely you’ve never heard of an internship like this one. ASCE’s 2017 President-Elect Kristina Swallow, P.E., ENV SP, F.ASCE, will be traveling to Society events this spring with a Younger Member from her hometown of Las Vegas in a one-of-a-kind job shadowing gig. 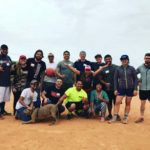 “I thought it would be a really great opportunity to share with a Younger Member what we do on the Board and more about the Society beyond the Younger Member programming, or the Section and Branch programming at home,” Swallow said. 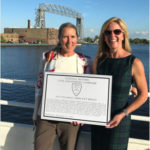 For her frequent travel, Swallow’s preferred airline awarded her a free companion pass last year. 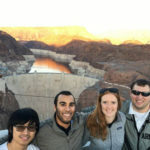 Her husband, David Swallow, P.E., M.ASCE, will be too busy with his work as senior director of engineering and technology for the Regional Transportation Commission of Southern Nevada to join her for every trip, so she pitched the idea to the ASCE Las Vegas Younger Member Forum. 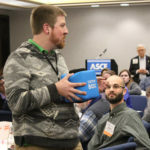 Come job-shadow the President-Elect at ASCE events across the country. You have to pay for the hotel room and any expenses onsite, but the flight is free. Suzy Trabia, EIT, A.M.ASCE, an engineer in the Atkins North America transportation group, certainly was intrigued. Trabia applied and was chosen to join Swallow on her trip to Washington, DC, last week. President-Elect Swallow and Trabia attend the OPAL Gala. 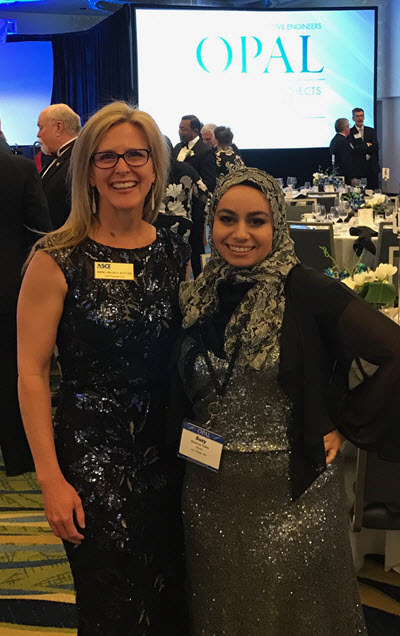 When Swallow attended the ASCE Legislative Fly-In, Trabia was by her side. When Swallow met with Sen. Catherine Cortez Masto (D-NV) to discuss infrastructure, Trabia was by her side. When Swallow donned formalwear for the annual ASCE OPAL Gala, Trabia was by her side. When Swallow took her spot at the table for the Board of Direction meeting … well, Trabia wasn’t literally by her side but she was in the room. Trabia praised her company – Atkins – for its support. She plans to make a presentation about her trip when she is back in the office this week. The advocacy work during the Legislative Fly-In made the biggest impression on her. Trabia hopes to join Swallow in Sacramento, CA, at the upcoming World Environmental Water Resources Congress if the logistics work out. She gets to learn more about ASCE and leadership. Swallow gets to gain more firsthand experience in the millennial perspective. Which means Snapchat.